A fundamental objective for the Tutor/Mentor Connecton (T/MC) is to help tutor/mentor programs everywhere organize, and share resources and knowledge. Programs like Cabrini Connections, we have seen, successfully develop education/employment prospects for the kids they serve. Ultimately of course this help everyone everywhere by grooming future leaders who participate intelligently in our democracy and our economy. While tutor/mentor programs work on the front lines to address problems related to kids and poverty, there are other businesses and organizations that can be very effective in supporting new and existing T/M programs. The Tutor/Mentor Connection takes an interest in helping these non-T/M organizations contribute to the fight as well. I explored why universities are helping last week. Well, it turns out hospitals and health care professionals should probably be interested in the work T/M programs are doing as well. Dan's blog last week referenced a peer reviewed article that was published on the website for the Center For Disease Control (CDC) in 2007. In the article, doctors argue that student performance is directly related to student health, and that America's failing schools and high dropout rates should be reframed as a "health issues." They explain that there are "long-term benefits of improved school completion (e.g., reductions in socioeconomic and racial/ethnic health disparities, lifetime health care costs, unhealthy behavior)" and that "as citizens, taxpayers, parents, and advocates for social justice, public health professionals can join the fight for ... improving school completion through fair and equitable means." Unfortunately, the doctors point out, "health professionals rarely [identify] improving school graduation rates as a major public health objective." "In addition, community-based programs can also promote adolescent health." It becomes clear that there is not only a common link among the concerns of healthcare professionals, educators, and T/M volunteers and donors. There is also something hospitals can do! Interventions! The Tutor/Mentor Connection loves the challenge of organizing such "interventions," and with this in mind, Dan asks the obvious T/MC-related question in his blog. He wonders, "How can we encourage hospitals ... around the Chicago area to set up leadership and learning circles, with a goal of building youth development, tutoring and/or mentoring programs in the area around each hospital, and throughout the region?" Fortunately, the T/MC has already developed a solution. They have created a strategic plan hospitals may want to draw from as they develop support strategies for tutor/mentor program and the kids. Last week, students and professors from Madison, Wisconsin's Edgewood College took a yearly summer trip down to Chicago to spend a few days with the kids at Cabrini Connections. Edgewood College's mission statement says that they are "committed to building a just and compassionate world" and that their identity revolves around "open, caring, thoughtful engagement with one another and an enduring commitment to service, all in an educational community that seeks truth, compassion, justice and partnership." From the Cabrini Blog, we see that these teachers set up "several large and small group activities at [Cabrini Connections] that focused on positive self esteem, building confidence, and positive communication. The group also had the opportunity to take part in activities around Chicagoland." The Edgewood-Cabrini collaboration provides a perfect example of how a typical university's philosophy tends to fit hand-in-glove with the goals of tutor/mentor (T/M) programs - each reaching out to work for social justice, aspiring to close the learning and poverty gaps, and (importantly) educating tutors/teachers as well as students. In fact, a quick look at mission statements from most universities and colleges in Chicagoland seem to suggest that this sort of partnership should be natural and regularly-occuring. I notice that every university I look at espouses the belief that institutions of higher education need to support the community and build partnerships. They also seem to unanimously believe, on some level, that a fundamental purpose for education is to work for social justice and equal educational opportunity. DePaul University, for instance, (point # 6 on my newest map below) "emphasizes social engagement and service to others," and has "formed lasting partnerships with community organizations." 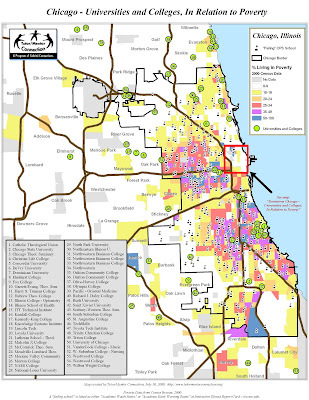 Sitting just north and east of many struggling communities, I imagine that DePaul would be interested in supporting programs like Cabrini Connections (located a quick 7 to 10 minute bus ride south, down Halsted) . Looking south of DePaul, the prestigious University of Chicago (#51) and six other institutions of higher learning sit on a virtual island in Hyde Park, surrounded on all sides by poverty and failing schools. U. of Chicago recognizes that they are indeed "uniquely positioned to contribute to, and draw from, the strength and diversity of this world-class metropolis." Almost begging to work with T/Ms, they write that, "At Chicago, campus and community are interconnected in partnerships that serve both to support the community and train future policymakers, social workers, artists, and social and political leaders." Northwestern University's president reports that "the second year of the Chicago initiative, an effort to reach out to the African-American and Hispanic communities in the Chicago area ... has been going very well" and states that he wants to"offer our students the opportunity to learn in a diverse community, thereby preparing them better for their careers. This is particularly true in the 21st century, when the United States is becoming increasingly diverse and the working world increasingly globalized." 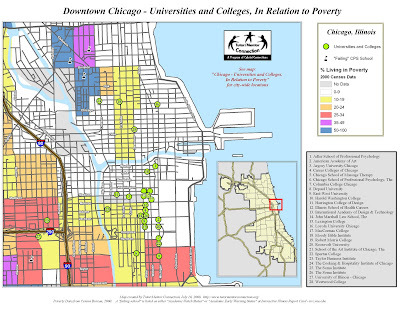 As we see on the map, opportunities exist for Northwestern (#35) to reach out to T/M programs in impoverished areas of Evanston itself, as well as to the south in the Rogers Park community of Chicago, where Loyola University (#21) lists among its 5 characteristics of Jesuit Education, "learning and leadership in openhanded and generous ways to ensure freedom of inquiry, the pursuit of truth and care for others." 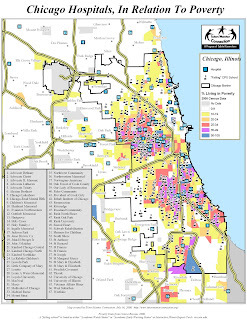 The University of Illinois - Chicago (UIC), is located just west of downtown (#27 in the expanded downtown map below), and sits almost like a gateway on I290 to West Side poverty. Like the others, UIC promotes a goal of providing "a wide range of students with the educational opportunity ... to address the challenges and opportunities facing not only Chicago but all Great Cities of the 21st century." Dan Bassill writes in his blog this week that, "if you're at Northwestern, or Loyola, you could have a great impact on the growth of programs in the North part of Chicago and in Evanston. 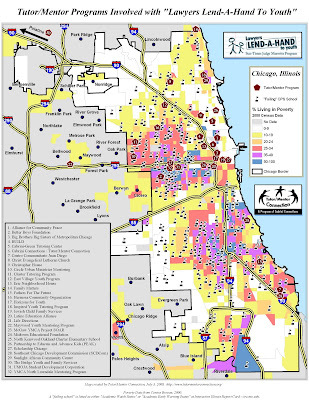 While if you're at the University of Chicago, you could have an impact in helping tutor/mentor programs grow throughout the South Side where our maps show so much poverty and too few tutor/mentor programs." One only has to look at this map, and combine the universities' existing philosophies and proximity to impoverished areas, to see how easily this can happen. 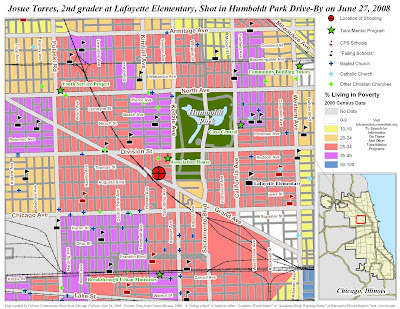 One of the more heart-wrenching stories from this past week involved an 8 year old boy, who while sitting with his parents in a van, on a Monday evening in Humboldt Park, was shot twice during a drive-by. Speculation in subsequent stories was that the gunmen were targetting his father in a gang related incident, and that Josue Torres was just in the way. He told doctors and nurses at Stroger Hospital - much to the delight Chicago Tribune headline writers - that, "You guys have been so nice to me. When I die, I'm going to miss you." Doctors ultimately saved the boy and the story captured the imagination of the entire city. Of course, many people know that Humboldt Park is a tough neighborhood, and likely aren't too surprised to hear another violent news story come out of the West side. If I can editorialize (of course I can - it's my blog :), you have to sort of suspect that if there wasn't a really cute and brave kid involved with this story, that the majority of people (as well as the news) would have just shrugged it off. "Big deal - they're all hoods in Humboldt Park." Of course, the truth is that most people in Humboldt Park are concerned about their families, their kids, and their communities. Most people are looking for solutions to the poverty, the violence, the frustration. My job is to look deeper than the surface... past the details the Tribune provides... and look at the work that concerned people and organizations are doing to mentor and tutor kids in neighborhoods like Humboldt Park, so that down the road, kids grow into adults with the skills needed to vanquish the poverty gap, ultimately curbing violence and making all our communities safer, economically healthy places to raise a family. Ok so with that said, here is a map of Humboldt Park. Several things strike me as I look at this map. First off, again, how many potential volunteers and donors drive past the West side of Chicago every day? Looking at the inset map, commuters race back and forth on the Eisenhauer and Kennedy expressways daily, to and from work. Major roads such as Western and Grand take commuting Chicagoans inches away from the kids who are suffering from the effects of poverty and associated segregation. How can they help? Each of them are multi-service programs that work to support kids and families in their community. 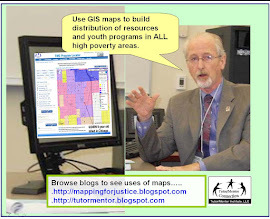 Each have been identified by the Tutor/Mentor Connection's Program Locator as organizations that may have tutor/mentor programs (although after visiting their websites, I notice that only Breakthrough Urban Ministries and Community Building Tutors specifically speak of "tutoring" and "mentoring" programs). And certainly each have volunteer opportunities available. While some volunteer opportunities besides tutoring or mentoring are likely to exist - and these services are important and worth your time - our goal here at Tutor/Mentor Connection is creating more T/M programs like the one in place at Cabrini Connections, and ultimately creating a network of volunteers who are fighting at the front lines in the war against poverty by mentoring kids who will eventually abandon the call of the street and take up leadership roles in America's social, economic, and political arenas. If you are at all interested in dedicating a small amount of your time with an organization please take a few minutes to contact them and see what kinds of volunteer or donor opportunities are available at any of the five organizations listed above, at Cabrini Connections, or at a program near you.